After 25 years of travel writing, SUE WALLACE is pleased to say it’s one of the best gigs in the world. EVER heard of neverrememberyourroomnumber syndrome or what about holdyourbreathinalift disorder; ask a travel writer and they may well relate. After 25 years of travel writing I suffer from both and it is getting worse. Neverrememberyourroomnumber syndrome works like this: Collect your room keycard, throw your bags inside the room, head out to explore, return six to 10 hours later and flash the card in front of every room until it eventually turns green; sometimes I even get the floor wrong. For some reason it is always the room number from the night before I remember. As for lifts, after being stuck in a small lift for 40 minutes in a hotel in Rome with a soccer nutter and a family with three children, it’s enough to send me climbing the stairs, just as long as it is not on the 31st floor. So I hold my breath when I am in a lift and rejoice when those doors open. Ladies loos are also a problem, especially if they are enclosed. These days I push my bag against the door rather than lock it. I once spent 30 minutes locked in a small cubicle at Tahiti’s Papette airport thinking I would never see daylight again while they removed the faulty lock and I counted to 100 many times over to keep sane. As for airports, they are the scene of the good, the bad and the ugly. Delayed flights, faulty planes and cancelled trips bring out the best and worst in people. Major hissy fits when flights are cancelled, partners tearing up tickets and storming off and kids having tantrums are no longer a rarity. But change anything? Never — ever since I slung a hefty pack on my back with passport in hand more years ago than I care to say, I have been addicted to travel. It’s often the smallest thing that means the most when you travel, such as a young Cambodian woman who gave me a flower, or that moment when you stand in front of the Mona Lisa in the Louvre in Paris and think, “wow”, watch a sunrise or a blood red sunset streak the sky. It’s the people you meet along the way too, who go out of their way to point you in the right direction, suggest a place to eat or just give a hand when your bag is so heavy you can’t walk another step. In 25 years I have learnt to travel lightly, never take anything for granted and appreciate the opportunities as well as getting horribly lost time and time again. Even though my stint with The Border Mail has come to an end, you’ll still find me sitting on a plane, train or driving, taking notes and photos — doing what I love. Here are some of the most memorable moments. Soaping up in the sky. There’s something weird and wonderful about getting your gear off 40,000 feet in the air and taking a hot shower. There are two shower spas at the front of the plane for first class passengers only, and your preferred time is booked soon after you board. The trouble is, you get in there and you don’t want to leave: the heated floor warms your feet, while the five-minute blast of hot water revitalises you. You can stop the timer while you shampoo your hair then restart it. In case of turbulence there’s a seat with a safety belt and an attendant just outside the door. Polar bear watching in Churchill, Canada. Watching these hefty bears tumble, roll and somersault then stand up and give their sparring mate a good clip around the ears is magic. Nothing quite prepares you for your first sighting of these magnificent animals in the wild, which intrigue, amuse and entertain as their lives unfold in front of you. Three days of intensive polar bear watching near Canada’s small town of Churchill, known as the polar bear capital of the world, leaves you under their spell. Polar bear watching in Churchill, Canada: Watching these hefty bears tumble, roll and somersault then stand up and give their sparring mate a good clip around the ears is magic. Barging down the Canal du Midi, France. You never know what’s around the bend on the magnificent sycamore tree-lined Canal du Midi in the south-west of France, passing vistas of vineyards, beautiful stone cottages and quaint villages. Hazel Young hosts our barge, the Fandango, while her son Daniel skippers the Tango. We stop at local markets to stock up on pates, baguettes, croissants and wine when I hear my name called — former mayor Arthur Fraunfelder and wife Julie are holidaying there too. Earth Lodge, Sabi Sabi Reserve, South Africa. A-listers including Brad and Angelina and Paris Hilton have fallen asleep in the Amber suite at this amazing reserve. As well as seeing the big five — a lion, leopard, rhino, elephant and Cape buffalo, all within two hours of arriving — I learnt Paris went to breakfast in her pink pyjamas, arrived with 24 pieces of real Louis Vuitton luggage and tweeted she saw a tiger. Staff then told her there were no tigers in South Africa. The amazing tree sculpture inside the Amber Presidential Suite at Earth Lodge, South Africa. Tinkling bells wake me from a deep sleep in a traditional Tibetan house high in the Himalayas, where dawn is just breaking on the surrounding snow-capped mountains. White goats scamper over the stones below with their bells ringing while across the other side of the valley, there are some fat yaks, a few horses and black and pink pigs enjoying a drink from the stream, under the watchful eye of a shepherd dressed in a warm coat and hat. It is where British writer James Hilton penned Lost Horizon. Fabled or not there’s been much talk this is the real Shangri La. Banyan Tree Ringha Resort in Jian Tang Town, Yunnan, Tibet. Just getting to Minaret Station, nestled in the rugged southern alps above Lake Wanaka, is an adventure — the only way in and out is by helicopter. As we fly in we spot tumbling waterfalls and rust-coloured deer grazing on ridiculously steep slopes. This remote Lord of the Rings countryside, which is 915 metres above sea level, leaves you marvelling at Mother Nature. It is definitely “glamping” at its best in a pristine wilderness. I can remember the tears, the grief and the silence when I visited the Ground Zero site back in 2006. Tears streamed down my face and the faces of many others as we gazed at the hole in the ground that was once the World Trade Centre. Through a tall mesh fence we stared in silence at the ghostly footprints of the centre and all that remained — just a small portion of a foundation wall and a staircase going nowhere. Emotions ran high as people from all over the world came to pay tribute to the 2973 people who lost their lives during the September 11 terrorist attacks, including the many rescuers who went to help and never returned. Turn off a busy Kuta street lined with swimwear, surfboards and souvenirs and you come face-to-face with 202 names of tourists, holidaymakers and those who just happened to be passing by, who lost their lives in an instant. No holiday is meant to end like this with innocent people killed by acts of terrorism. I remember standing in front of the memorial, flanked by national flags of the victims, and my thoughts just went out to the families and friends whose lives will never be the same. Nearby, a young Balinese woman caught my eye as she bent to light a candle. She told me it’s a daily ritual. “So terrorists know they didn’t win and the families of those who died know they are never alone,” she said quietly, returning to her shop across the street. When the plane touches down at Albury Airport I often feel like kissing the ground in gratitude that I am back safely. It’s true that there’s no place like home, back with family and good friends. Thank you to all who have shared their stories, laughter and tears over the years; it’s been a privilege to write about your journeys. 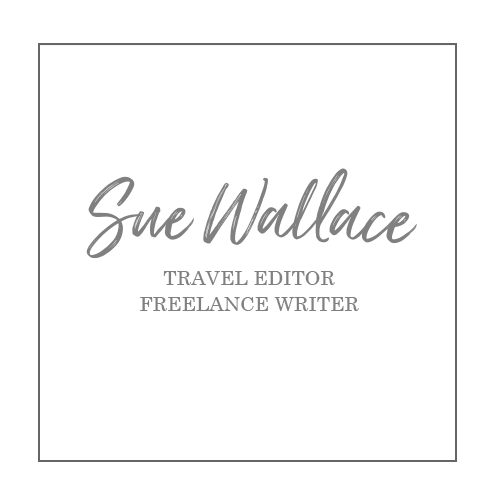 Sue Wallace has written features and travel for The Border Mail for the past 30 years. You can follow my travels at thefinerthingsintravel.com or on Twitter @swalltraved.